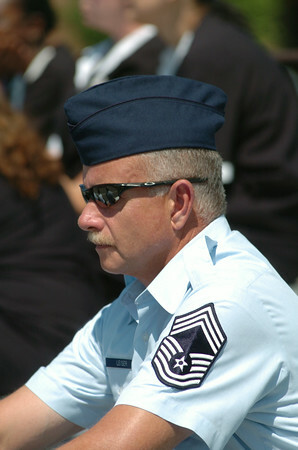 DAN CAPPELLAZZO/STAFF PHOTOGRAPHERNiagara Falls - Chief Master Sgt. Bob Leiser, of the 107th Airlift Wing, of the New York Air National Guard listens during a ground breaking ceremony at the Niagara Falls Air Reserve Station for the new Community Activity Center. The 9.8 million dollar facility will replace a number of existing buildings to include the current All Ranks Club and base dining facility.